OVER-THE-TOP JOUSTING! - Countless enemies had been shot, hacked and slashed in the history of games. Now it is time to ram a wooden lance in some gut, send your foes flying, and watch them bite the dust! Body parts ripping off, ragdoll horse physics, and destructive environments included. A BEAUTIFUL BRUTAL WORLD – Dive into a magical fantasy world full of treasures and adventures! Don't be fooled by the cartoony looks: here, simply bumping into a silly wooden fence spells a sudden end to your hero's life. If you fancy dying in a more heroic way, how about getting swallowed by a giant toad, falling into a lava pit, exploding from eating too much turkey, getting impaled by a Hitler Snowman, or just getting lit on fire by a dragon! BUCKETLOADS OF CONTENT – Divided into three major parts - the Story Mode, the Endless Journey Mode and the Rogue Rider Mode - this game has a lot to offer and there is always something new to accomplish, find, or unlock. Power-ups, characters, view modes, mutators, quests, game mode variations, randomly generated hats, you name it! Did you ever wish to be a skeleton king with a fancy wig riding over rainbows on a flower-pooping pink unicorn? It's all up to you in this game! INSPIRED BY CRASH BANDICOOT – Good third-person platformers were always hard to find on PC, when consoles sport countless shining examples: the first Crash Bandicoot titles, Spyro, Ratched & Clank, and Super Mario were all a big inspiration for Last Knight. This game kicks it up a notch with non-stop jousting action, no-health instant death, procedurally-generated worlds, as well as custom-crafted levels with Knightmare levels in-between. To top it off, the new Rogue Rider Mode pushes it all into a rogue-like direction, and if you don't like third-person view, try playing in first-person mode! Easter is almost upon on us this means it is time to grab your bunny mask and joust some evil Easter bunnies or anything that could be one! Of course you also need to shove a lot of eggs turn your throat til you explode. Wait, no, just enough so you don't starve. 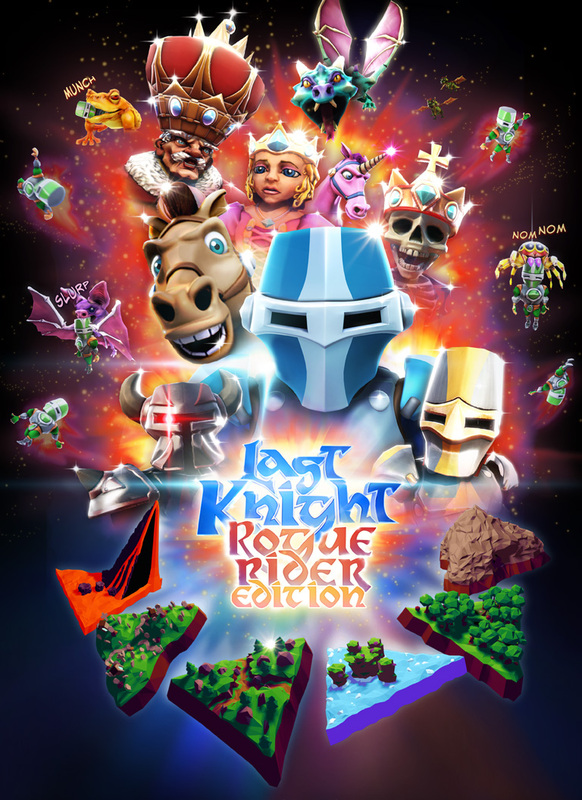 This weekend is your last chance to grab Last Knight for 75% off! If you already have it this is also a good time to recommend it to your friends. In case you have not found a Bunny mask yet you better get going and find one. Luckily in this Easter event they are much easier to find, just look out for some giant Knight Suprise TM eggs. If you now want one for your Easter decoration or just to paint something more exciting then a odd distorted spherical thingy you can print this bunny head with your 3d printer: Thingiverse.com No 3d printer? Don't worry, in a couple of years everyone has one. While the Easter event is going on you can also search for eggs in the menus which change things in various ways. Just click on them to crack them open and again to deactivate them. Last Knight Halloween Event and some Making Of with pictures and gifs. Update #10 - Easter Event! The Last Knight Easter event has started! It includes lots of bunnies and eggs. Plus, some 3d printing of Last Knight models. Big X-mas Mow Down and Demo! A new game mode for Christmas and a free special X-mas demo! Some wallpapers of Last Knight. Wallpaper-boxart, Wallpaper-environment-day and Wallpaper-environment-night. I think that you have taken the Temple Run concept and have put in a creative idea that will create the best game in this genre yet. Well done! Hey, I was just wondering will desura/ Website buyers get a steam copy? Really enjoying the game and can't wait to show my steam friends what im playing! Yea, everyone will receive a Steam key. A little confused - Is the Christmas standalone a permanent feature? Meaning, if we already owned the game prior to the release of the Christmas standalone, do we lose the ability to play it after January 2nd? I'm not at my gaming computer right now and probably won't be until later in January, so I'm worried I won't be able to play it when I get back. To clarify this, the Xmas mode can be played whenever you want. I just take down the Xmas mode standalone download after the 2nd. The Xmas mode will be also in the full version for forever but it is not yet. Never mind, I found the download link in the earlier news update. Lightning strikes ― are they unique to the Christmas stand-alone version or are they incorporated in the full game (got version 1.18)? They are in there in the 1.18 and the Xmas Standalone. Thundersnow is usually a very rare thing but in the Xmas mode it can happen much more likely. While "normal thunder" can happen more likely on the graveyard and with rain. In the story it is also in the 2nd graveyard level and the first level of the last chapter. So, it occurs in the Endless modes, too? Yea, it is already more likely to happen the more far you make it but it is mostly random. You can easily make lots of rides with thunder never happening. Also, it is not as hard as the video might make it look. Before a thunder bolt, that could hit you, impacts it is shown with a lightray so you can dodge it.